Called a hard-boiled poet by NPR’s Maureen Corrigan and the noir poet laureate in the Huffington Post, Reed Farrel Coleman has published fourteen novels. He is a three-time recipient of the Shamus Award for Best Detective Novel of the Year and a two-time Edgar Award nominee. He has also won the Macavity, Barry, and Anthony Awards. Reed is and adjunct professor of English at Hofstra University and lives with his family on Long Island. My first novel, Life Goes Sleeping, was published exactly twenty years ago. In November, with the publication of Gun Church (Audible.com) and Hurt Machine (Tyrus Books), I will have published fourteen novels. Twelve of the books PI novels in three series. Two, Tower (co-authored with Ken Bruen) and Gun Church are stand-alones. I also write and publish poetry, short stories, and essays. 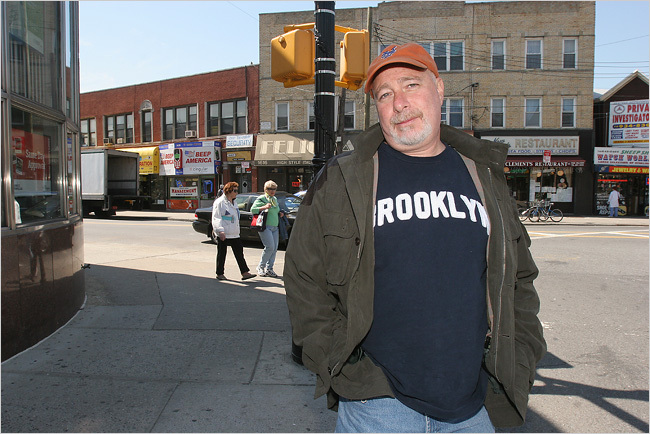 I’ve edited or co-edited two poetry journals and was the editor of the short story anthology Hard Boiled Brooklyn. I can’t understand, frankly, why I get no interest from UK publishers. Hopefully, your interviewing me will help there. What made you decide to write crime fiction? Long story, but I’ll try to keep it short. I was trained in poetry and never cared much for crime fiction. I never really read much of it. I was a snob. In the mid 80s, I was working as a freight forwarder at JFK International and had to travel into Manhattan once a week for business meetings. There were several hours of downtime between leaving work and those meetings. I decided to take a night class at Brooklyn College to fill those hours. The only class that fit my schedule was a course on American Detective Fiction. The first two reading assignments were Hammett’s The Continental Op and Chandler’s Farewell, My Lovely. Three weeks into the class, I went to my wife and told her I’d found purpose to my life. I was born to write crime fiction. Your books have been called hardboiled mysteries, crime novels and noir, how would you best describe your books? Labels don’t much matter to me. National Public Radiocalled me a hard-boiled poet. The Huffington Post called me the noir poet laureate. But does anyone really care? When Viking/Plume signed me, I think they believed I was a literary writer who wrote crime fiction. They had it exactly wrong. I’m a crime fiction writer with a somewhat literary style. Character, hands down. However, as I’ve evolved as a writer, I do feel that plot has grown in importance to me. Readers may not remember the plot once they close the book, but a good plot helps keep their interest. Your latest book is Hurt Machine and is the seventh book in the series to feature Moe Prager. What was the impetus for the story? What kind of research went into Hurt Machine? I despise research, but I did some for this book. My cousin Paula is a renowned oncologist and we had a very bizarre phone conversation about the various forms of cancer. The plot is also loosely based on an actual incidents that happened in NYC a few years back, so I did some reading. But my books are not info dumps. They’re about people, about human emotion, about choices. I don’t need research for that. 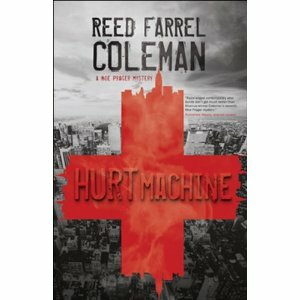 In Hurt Machine, you deal with various issues such as bureaucratic greed, sexual harassment, and blackmail. Did writing Hurt Machine give you a better insight into these issues? Absolutely. David Morrell says that writing is a kind of self-psychoanalysis and exploration. While I wouldn’t go quite as far as that, I do think it is an exploration. I enjoy putting myself in other people’s heads and hearts and poking around. One of the things that I like about your Moe Prager series is the fact that Moe is such a pragmatist and to a certain extent quite cynical. Where did the character come from? Is he an amalgamation of various people that you know? Is there any part of you in Moe? Me, cynical! I don’t usually base characters on other people, so he’s not an amalgam of others. However, Moe is like my internal voice. He does share my attitudes and world view. He is definitely the character most like me. He is kind of a braver, better looking, not quite as intelligent version of me. Moe has a lot of connections to the NYPD despite the fact that he is no longer a cop. What kind of freedom has this given you as a result? The same kind of freedom all ex-cop PI characters have. On the one hand, he can get inside info from old connections on the job. On the other, he isn’t constrained by the same rules that the police must follow. It’s a classic PI conceit. In hindsight, is there anything about your Moe Prager series that you wish you could change? I am often torn by the fact that I had Moe and his brother go into the wine business. The minute people read “wine shop owner” on flap copy, they assume the books are cozy-ish. My novels are anything but cozy-ish. It’s caused some problems. Yet the whole point of the wine shops is that Moe despises the business. It eats at him. It motivates him to take cases he shouldn’t just as a means of escape. Your books always have a sense of place and in this case New York where a majority of your books are set. What is it about the city that made you pick it as a backdrop? Well, actually, most of the books are set in the borough of Brooklyn, specifically in the Coney Island, Brighton Beach, Sheepshead Bay area where I was raised. The great thing about New York City, like London, is that it is a city that everyone thinks they know, but don’t really know at all. I mean, most people who visit London have gone to Buckingham Palace, Soho, Trafalgar Square, but how many have been to Deptford or ventured as far as Slough? I’m the guy who wants readers to see a corner of the world they haven’t seen. What makes your characters real for you? Must you work out everything about them beforehand or do you just let it flow? I never ever outline. It absolutely kills the pleasure of writing to outline. I enjoy the excitement of letting characters dictate to me who they are. What makes characters real for me is their voice and their feelings. I need to be able to hear their voices in my head. Once I have the voice, I have them or they have me. You co-wrote Tower with Ken Bruen. How much did you enjoy doing it and did you find any part of it difficult? I found every part of it difficult. I like to joke that it was a good thing Ken and I had 3000 miles of ocean separating us and that neither one of us owns a handgun. It was the hardest work I ever did and was also the most Zen-like experience I ever had. Ken sent me half the book but with no real instruction on how to finish it. He resisted all efforts on my part to give me help. I felt like the other hand in the one hand clapping metaphor. In the end, though, Ken was incredibly wise not to help. It forced me to push myself as a writer and a person beyond limits I thought I had. We must’ve done something right. Would you do another collaboration and if so is there anyone you would like to do it with. I would indeed. Peter Spiegelman and I began a novel together a few years back and hope to someday work on a project together. SJ Rozan and I have talked about teaming up. I think there’s a kind of appeal/repulsion thing that goes on with writers and collaboration. You are a reader of crime novels, do you still find time to read and if so do you have any authors that you prefer to read above others? I do find time to read, but unfortunately my reading is limited to crime fiction only these days. I also find I can’t put the genie back in the bottle. I simply don’t enjoy reading as much as I once did because I have seen the man behind the curtain. I can’t help but read analytically. This is why when I find a writer who can transport me and relieve me of the weight of analysis I stick with that person’s work. Woodrell, Megan Abbott, Spiegelman, Peter Blauner. I also like Frank Bill. I hope I never stop being influenced by other writers. I think everything I read influences me. At least I hope it does. Reading great writing motivates and inspires me. Is there a crime novel that you wished you had written? So far you have won three Shamus Awards for Best Detective Novel also the Macavity, Barry, and Anthony Awards, and have been twice nominated for the Edgar® Award. How did you feel about winning the awards and do you have a favourite? Feels great to be nominated and even better to win. I wish it translated into bigger sales. My favourite was winning the Shamus for Soul Patch. Until that ceremony, my wife had only ever seen me lose. In Baltimore, for that novel, she finally saw me win. It was also my favourite because a Poe impersonator gave me the award in the church where Poe is buried. When I came off the stage, Lawrence Block, one of my writing role models and not a man given to big shows of emotions, gave me a big smile and a thumbs up. You are quite well known and regarded within the crime fiction community, do you find it rather frustrating that this is not the case outside the community? Yes, but I’ve come to accept that my fate is my fate. You can’t wish yourself to have a different career. Whenever I get frustrated, I realize that there are thousands of writers in the world who would give anything to have my career. I regret not being more commercially successful—something that can change—because I want things to be easier for my family. They have made a lot of sacrifices for me to follow my vocation.I would love to be able to make their lives easier. I have recently signed a contract with a Canadian publisher to write two novellas featuring a detective named Gulliver Dowd. Dowd is a dwarf who became a PI after his cop sister was murdered under mysterious circumstances. It’s great fun and Gulliver is a really interesting character. Where do you find it easiest to write and why? I have an office in my house. Now that the kids are at college and out of the house, I have total silence. I need no distractions when I write so I can listen to my internal voice. No music, no looking out the window, no TV, no nothing. Like most writers, I find bridge scenes the most difficult. It took me about seven books to figure out how best to deal with them. How do your family feel about your writing? They are incredibly proud and supportive of me and like I said previously, I wish I could reward them for the sacrifices they have all made. Funny story: For a long time, my son Dylan was rather blasé about what I did. I mean, he’d only ever known me as a writer, so he wasn’t terribly impressed. Then one day I handed him my cell phone and let him listen to a voice mail message I’d received. His eyes got big and his jaw dropped. The message was from Stephen King. Instant street cred. When the weather is warm, I play basketball five or six days a week. I also play golf to torture myself. I do all the cooking in the house. If I had to go back and choose another path, it would have been to be a chef. I love Bouchercon, Murder and Mayhem in Muskego, etc. I really dig hanging with people who do what I do. I love talking about process with people who understand. Where is the best place you ever held a book signing? Hard to say. I have great signings at Otto’s Mysterious Bookshop in NY where I do my launch parties. I have also had great fun at Partners and Crime, Poisoned Pen, and Murder By The Book in Huston. What one luxury item would you take away with you if you were marooned on a desert island? I’m not touching that one. What constitutes a luxury item? If Moe Prager could invite five people to dinner whom would they be and why? Jesus, Shakespeare, Freud, Wittgenstein, and Einstein. To see who if we would divide the bill evenly and who would cheap out on the tip. Just kidding ... just kidding. If you could choose five crime characters, dead or alive, whom you could take to dinner whom would they be and why? Philip Marlowe, Sam Spade, Matt Scudder, Dr. Moriarity, and Jamalee Merridew. If I were to look in Moe Prager’s fridge what three things would I find? Kosher pickles, leftover pizza from DiFara’s on Avenue J, and a bottle of Veuve Cliquot. Ghost Hero by SJ Rozan. I don’t like the sound of that!